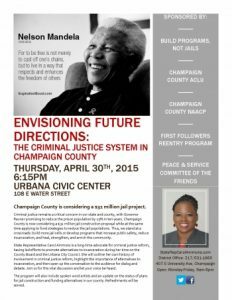 Participate with State Representative Carol Ammons and Build Programs, Not Jails as we examine and discuss the future of Criminal Justice in Champaign County. Build Programs, Not Jails member, James Kilgore examines the need to add jails to the discussion of mass incarceration. Check out his recent article on Truthout. Needs Assessment Submitted: What Next? On September 24th, Dr. Alan Kalmanoff presented the needs assessment on the criminal justice system to the County Board. This brought an investigation which lasted more than a year to a close. Kalmanoff's report largely concurred with what the Board appointed Community Justice Task Force had presented in their submission in June. Both have emphasized the need for a thorough re-working of the criminal justice system and downplayed any notion of building new jails cells. The Community Justice Task Force, a body appointed by the County Board to study alternatives to incarceration, presented its report on June 25th. They recommended a shift toward restorative justice and an increase in the percentage of the Public Safety Sales Tax ($4 million per year) that goes to prevention from 5% to 30%. CUCPJ support this and is calling for a re-entry program, Racial Justice Task Force, and a community-based mental health facility. Join our next planning meeting August 21at at 6pm at the Independent Media Center (downtown Urbana post office). Our No More Jails Campaign is moving to a crucial stage as the County Board gets ready to vote on a potential expansion of the jail this Fall. In preparation, we would like to invite you to an action-oriented No More Jails planning session on August 21st at 6pm at the Independent Media Center. After pressure from the community and members of CU Citizens for Peace and Justice, the county and consultant Dr. Alan Kalmanoff have extended the deadline to receive comments on the Champaign County Criminal Justice System Assessment Draft Report at May 17th. Your comments are needed to ensure that final report reflects the needs of the community. Please take time to share. Needs assessment is now available for download. Come tell the county board what you think Thursday, May 2 at 6pm.